Hi my lovely beauty junkies, today I want to review my all-time favorite sunscreen: the Hada Labo UV moist emulsion SPF 50+ PA +++. I have been using this sunscreen for a while and it really has become my holy grail product. I must admit it’s my first Japanese sunscreen so I can’t compare it to other Japanese sunscreens (promise to do it in the future). However, I have used many western sunscreen and this Japanese jewel so far is the best in its category. A sunscreen is one of the best anti-aging products you can use, more than 80% of our future wrinkles and age spots are the result of photo aging. This sounds horrible and count in the risk of skin cancer you will never ever want to spend a day without a good sunscreen. I find that many western sunscreens are greasy, thick and leave a white cast. Because of it I actually tried to avoid using sunscreen in the past, didn’t like how my makeup looked, break outs, or it felt heavy etc. If you know an outstanding western sunscreen please let me know, I would love to try. I heard so much about Japanese sunscreen, how outstanding they are, good formulated with high UVA and UVB protection. The Japanese can’t life without sun protection so no wonder there are so many good quality sunscreens, high demand and competition. There are many Japanese popular sunscreen like the Biore and Anessa. I bought the Hada Labo UV moist emulsion SPF 50+ PA +++ because its free of irritating additives, fragrance, parabens, mineral oil and alcohol. Furthermore I love that it has the brands signature ingredients, three types of Hyaluronic acid for deep skin hydration (see my review for their bestselling Hada Labo Lotion). The packaging is simple but practical to use, as with most Hada Labo products. The size (38ml) is very travel friendly and the pump hygienic. . It’s a Japanese drugstore product so really affordable. I got it on eBay for 14 euro including shipping costs. Here is what Hada Labo promises: High SPF50 PA+++ for long hours broad spectrum protection against UVA and UVB. 3-in-1 benefits: UV protection + hydration + makeup base. With 3 types of Hyaluronic Acid to deeply moisturize skin and help preserve its optimum moisture balance. Light silky smooth texture, transparent and comfortable on skin. Skin pH balance and low irritation. Free of parabens, fragrances, mineral oil, alcohol and colorant. Suitable for daily usage on face and body. The ingredients are really safe for sensitive skin, no red flags running it though Cosdna. The sunscreen contains both chemical and physical filters (Ethylhexyl methoxycinnamate and Zinc Oxide). PA is the Japanese measurement of sun protection of UVA , which is similar to the SPF method of measuring UVB light protection. These are the three levels of protection: PA+, PA++ and PA+++. So PA+++ in this sunscreen provides the highest level of UVA protection you can get. 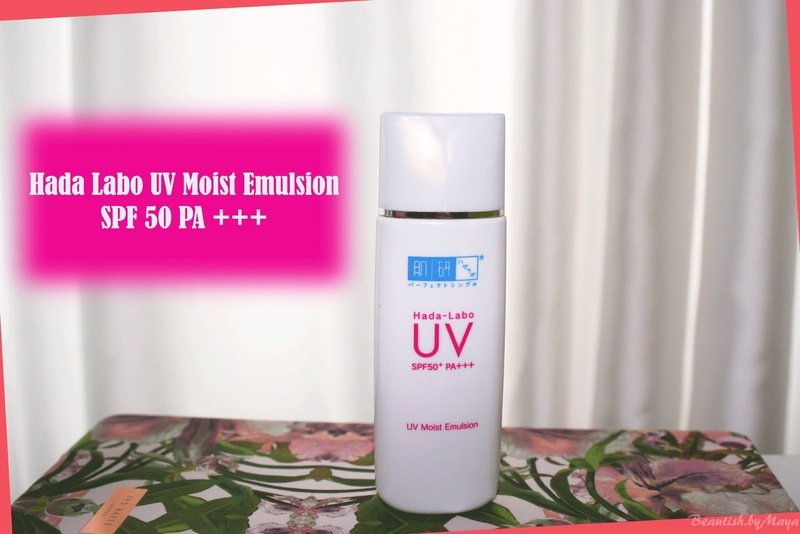 I apply the the Hada Labo UV moist emulsion as the last step of my skin care routine, its basically my makeup primer. I skip using a makeup primer and sometimes even moisturizer because it’s quit hydrating. The texture is very liquid milky lotion like. It spreads easily, absorbs fast but leaves a light sheen on the face, I think it’s because the lack of alcohol (which has a drying effect). This product has no smell to it as there is no fragrance in the formula. Best thing about this sunscreen, it feels lightweight and leaves no white cast. I also think it’s really long lasting, after wearing it for more than 8 hours and walking In the sun my face is safe, no red areas. Many sunscreen tend to dry out my skin, but with this product I feel that my face is so hydrated. It could be to moisturizing for the hot summer days and I may try a sunscreen with alcohol. Actually, most Japanese sunscreen contain alcohol because it facilitates the absorption and the weather is so humid in Japan. However, having over sensitive skin I’m very cautions with alcohol formulate products. After application the sheen is actually a semi-dewy finish which I really like, my face looks hydrated. This product seems perfect for my skin type now (sensitive combination skin) but I may need better oil control in the hot summer. If you have sensitive skin and are looking for a light formulated sunscreen with safe ingredients (free mineral, alcohol, etc.) this products will be perfect for you. I really can’t recommend it enough and it’s so affordable. I use SPF every single day, but I haven't tried a Japanese one yet. You should try a Japanese sunscreen I'm sure you will love them! they are so good formulated really intended for everyday use.